Students in the Upward Bound program participated in an intensive, two-week mentorship program run by students in the Haitian Student Organization. 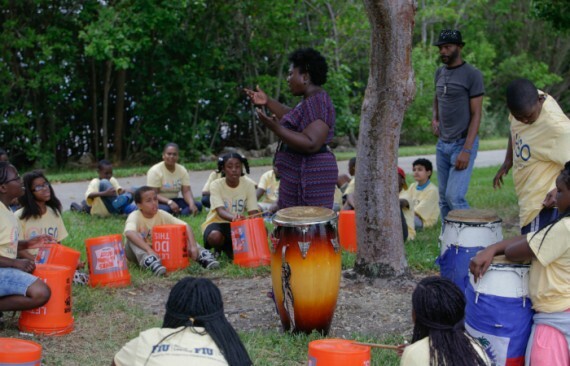 Here, volunteer mentors participate in a drum lesson. 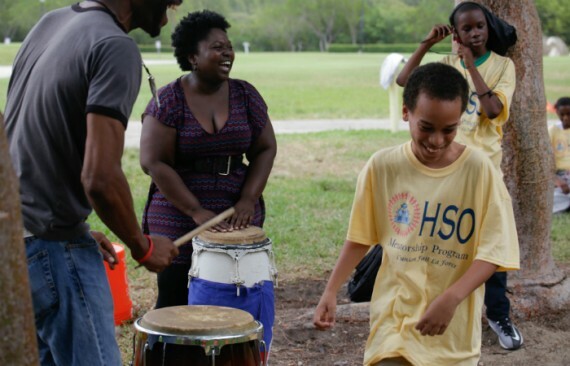 It’s a traditional Haitian greeting and for about 40 middle school students who are Haitian, of Haitian descent or who have an interest in Haitian culture, this phrase punctuates every lesson and workshop offered through a mentorship program developed and run by FIU students in the Haitian Student Organization (HSO). 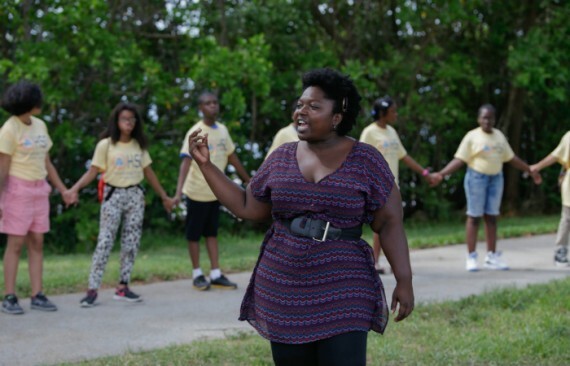 The intensive, two-week program intended to help these children reconnect or in some cases connect for the first time with their Haitian roots is the latest example of how FIU students are striving to make an impact on South Florida before they graduate. Roughly 436,000 of Florida’s 19 million residents are Haitian or are of Haitian descent according to the U.S. Census Bureau’s 2013 data estimates. Many, according to Gauthier, are just like her – either born in the United States or have lived here long enough to have assimilated into American culture never having learned much about Haitian culture or what it means to be Haitian. As it turned out, there was a strong desire among these middle school students to join the mentorship program, which is supported by the university’s Office of Global Learning Initiatives and the Kimberly Green Latin American and Caribbean Center. “When we went to the Upward Bound program and explained to the children what we wanted to do and that it was voluntary, everyone raised their hand,” said Gauthier, who developed the program while she served as president HSO. In classrooms across the Biscayne Bay Campus students have learned about Haiti’s ties to African culture, its history and even recent diplomatic developments with the Dominican Republic. They also had a chance to practice speaking, writing and singing in Creole. Samuel Gabelus, 12, spent a recent morning working Creole words into a poem he would later place on the back of a construction paper African mask. “I wanted to learn more about Haitian culture because my grandmother taught me a lot, but I wanted to learn new things so I could teach her,” Samuel said, citing facts about the creation of the first Haitian-Creole dictionary in the 1970s. 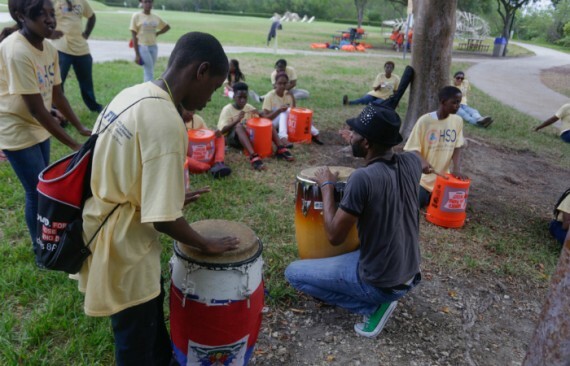 Samuel and his classmates also took part in playing the drums while singing a rendition of “Ti Zwazo” (Little Bird), a Haitian folklore song that is well known by children in Haiti, said Floriza Fils-Aime, who is working toward a master’s in social work and who volunteered through HSO to help run the mentorship program. The song, however, was new to Hendy Marcellus, 11. Ultimately, they learned more than just how to fit in. It was an honor to be a Mentor for these children for 2 weeks. They definitely took a peice of my heart. 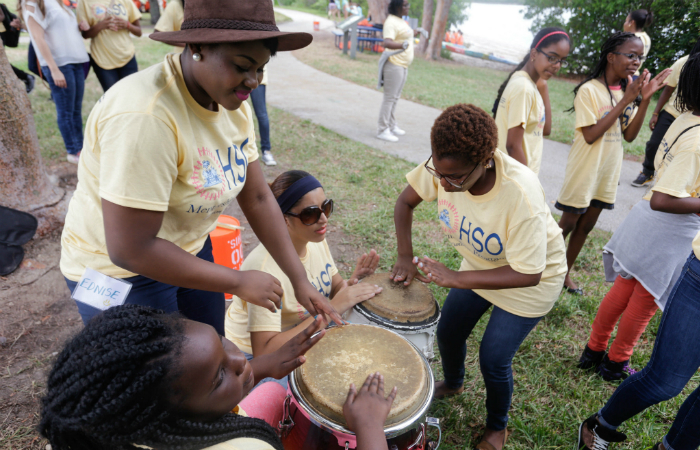 #HSOMentorshipProgram #HSO #HaitianStudentOrganization – Love and Support has no color or nationality. I love that this is being done. I am not haitian but all throughout middle school and high school I witnessed bullying towards many haitian kids just like me and never understood why. No one wanted to admit they were from haiti and felt ashamed even. There is no reason for anyone of any country to feel this way. I love the social outreach that the program provides and the confidence that it is building in these kids. 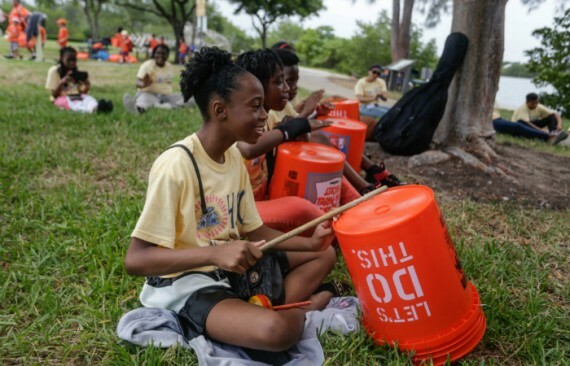 That’s too cute with the overturned buckets for drums.